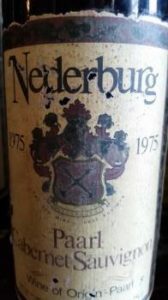 “Nederburg has been built on two pillars: Sweet wine and Cabernet Sauvignon,” says Distell head winemaker and former Nederburg cellarmaster Razvan Macici before a closer look at one of those pillars in particular, a tasting spanning multiple decades of the winery’s top-end Cab: Selected 1966, Paarl 1975, Paarl 1987, Paarl 1997, II Centuries 2010 and II Centuries 2012. It re-enforced a couple of pre-conceived ideas for me – the SA wine industry produced wonderfully composed, age-worthy red wines in the 1960s and 1970s, lost its way in the 1980s and 1990s and has started to find its way back since the mid-2000s. The 1966 was the legendary Günter Brözel’s ninth vintage. Apparently 100% Cab, unusual for the time, it was fermented in horizontal pressure tank and matured in large oak vats. Light bodied but showing some macerated cherry to go with inevitable developed character, it was still pleasing to drink if not as complex as some of the Zonnebloem wines of the same decade I’ve encountered in recent times. Rating: 89/100. The 1975, tank fermented and vat matured, is still in good nick. Red cherry, black berry, earth, mushroom, boot polish and soy sauce. Medium bodied with fresh acidity, it’s still got plenty to offer. Rating: 91/100. The 1987, barrel matured, was quite severe if not undrinkable. Leafy and leathery notes on the nose. Lean and mean with sharp acidity and tannins which remain firm. Rating: 85/100. By 1997, Newald Marais had replaced Brözel and unfortunately this was the weakest wine in the line-up. Overtly vegetal on the nose and palate, it appeared simple and short. Rating: 83/100. Come 2010 and Macici was firmly in charge. Grapes for the 2010 vintage are sourced from vineyard some 35 years in age in the Simonsberg-Paarl ward and it’s accomplished, if in a very modern idiom that favours weight and power. It rated 91 points in the Christian Eedes Cabernet Sauvignon Report earlier this year (see here). The 2012 vintage, meanwhile, was awarded double gold at Veritas this year even though commercial release is only scheduled for 2017. If anything, it’s even sleeker than the 2010 and a provisional rating would be 92/100.